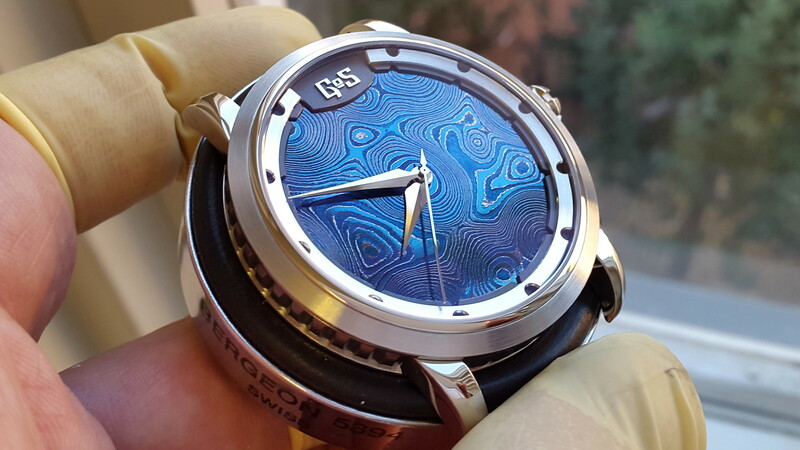 Patrik Sjögren developed the GoS Ice Blue tempering of Johan Gustafsson's hand-forged Damascus steel for the Nordic Seasons collection in 2012. 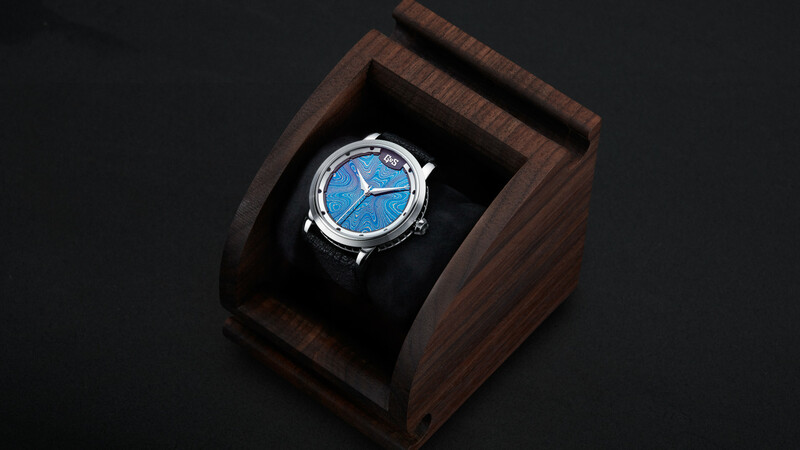 The idea was to use traditional heat tempering but to carefully increase the temperature above what results in the dark blue, which is common in watchmaking, to instead achieve brighter blue nuances. 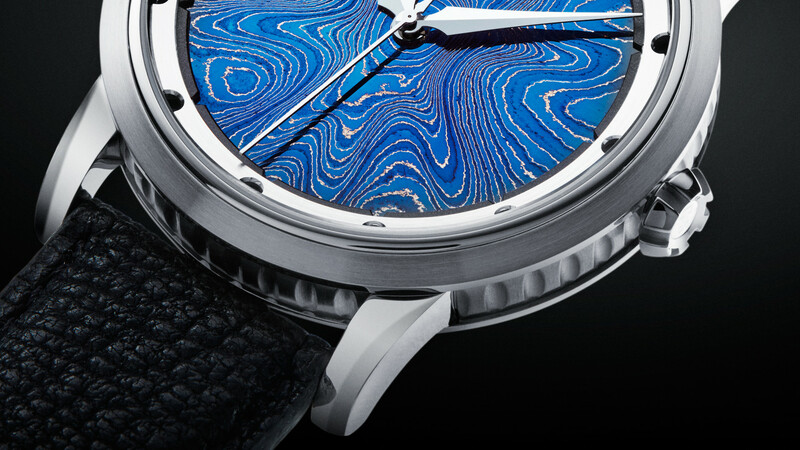 Patrik creates separate blue nuances for the two different steel types in the Damascus steel pattern by tempering the dial in multiple steps. The colors of tempered steel are created when light is reflected on the surface and slightly different nuances can be experienced based on the angle of reflection and the light source. These dynamics combined with the highly detailed and reflective surface results in a dial that is both elegant and eye-catching. 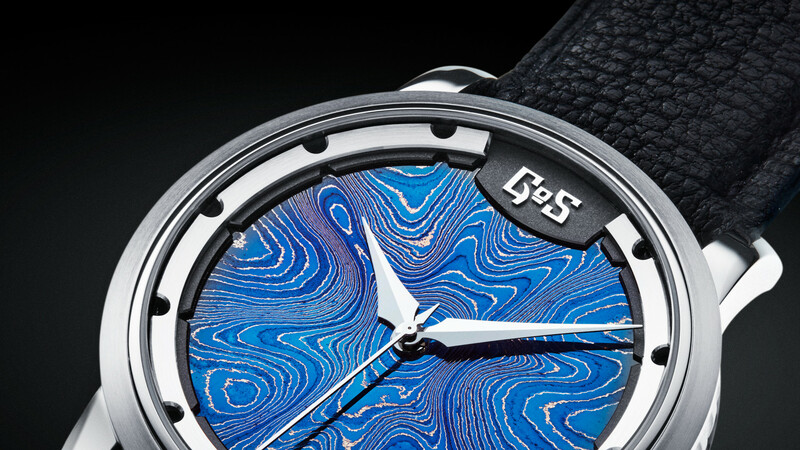 GoS introduced the Nordic Seasons Winter during Baselworld 2012 and the Ice Blue tempering was featured again in the first GoS dress watch Bifrost two years after. Patrik and Johan have now further refined both the steel patterns and dial finishing and are proud to add Sarek Ice Blue to the GoS collection. Sarek Ice Blue is delivered with a Moose leather strap and GoS offers four different choices of which the lighter Khaki or the glossy black are expected to be the most popular alternatives with this dial. 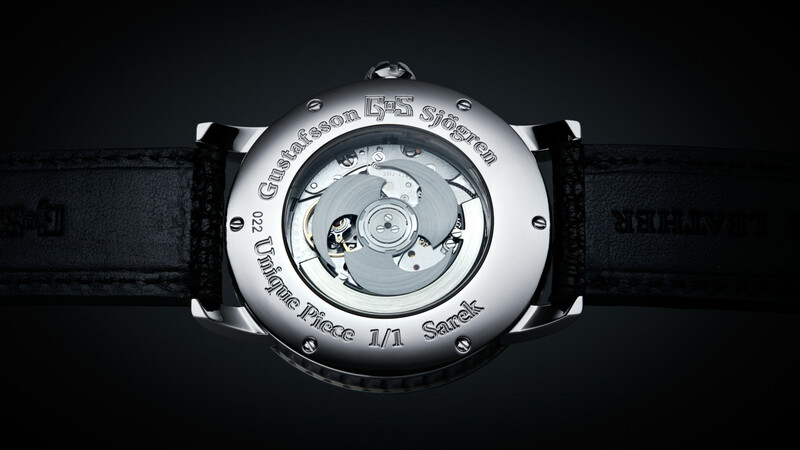 The Sarek is powered by a Soprod A10 movement that has been customized with a GoS triskele rotor. The triskele design is the GoS version of the famous Viking symbol with three interlocked horns and has been present on GoS watches since GoS was founded 10 years ago. 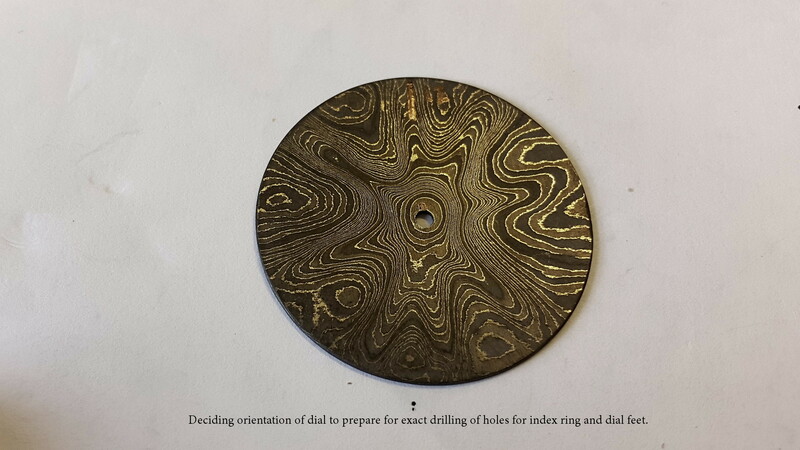 The dark rotor is finished with a circular satinization and is equipped with an additional counter weight made from German Silver. 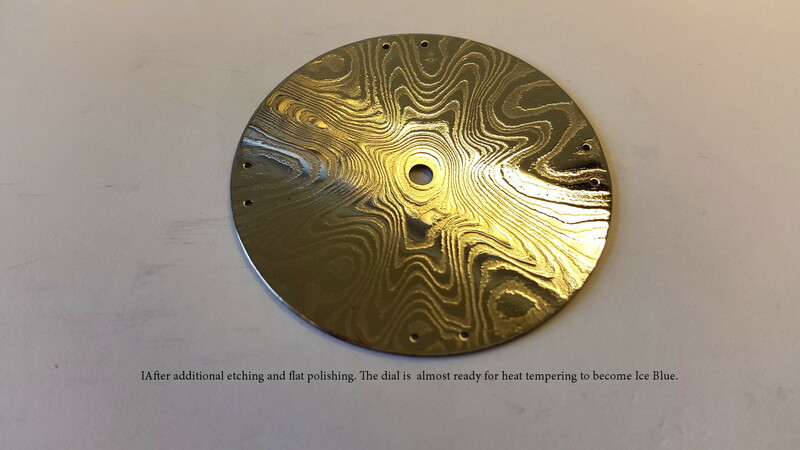 The counter weight is hand-finished with polished bevels and circular satinization on the top for maximum contrasts. The watch is mounted on a soft cylindrical pillow made from reindeer suede which is secured inside the box. Movement: Soprod A10 with GoS triskele rotor, dark satinized and addititional counter weight in hand finished German silver. 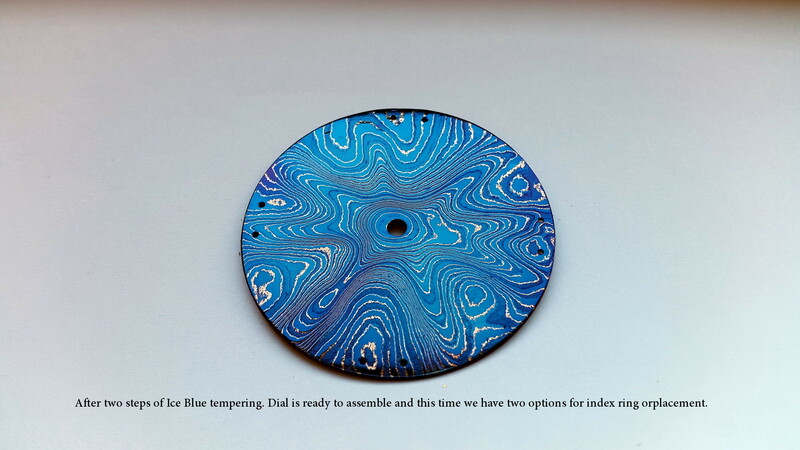 Dial: 164 layered steel Damascus steel with a Wildflower or Pools pattern and a GoS Ice Blue tempered finishing. Index ring/rehaut: Two layers combining previous GoS design with inspiration from viking bracelets. Crown: GoS design in highgloss polished with satinized grooves. 7mm in diameter and with double gaskets. Case finishing: Stainless steel, worked and finished with inspiration from viking bracelets. Every watch engraved with “Sarek 1/1” to indicate that every watch is a unique piece in addition to a serial number. 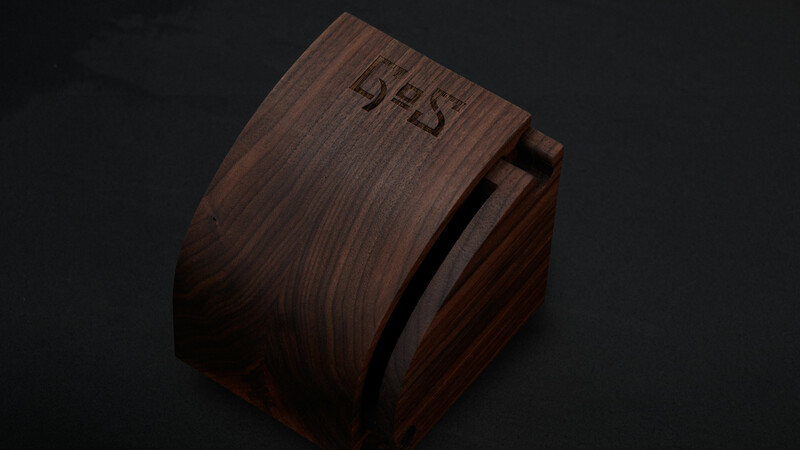 Delivered in handcrafted presentation box in Walnut, made by Kanevad wood artist. The retail price of Sarek Ice Blue is US$9,500 +applicable taxes and dials will be provided for selection and approval on watches produced on order. Copyright © 2015 Gustafsson & Sjögren. All Rights Reserved. Design by Vallagruppen.